I’m walking along Tern Island, French Frigate Shoals, fresh in my first experience working with seabirds in the Northwestern Hawaiian Islands. During my survey I come upon a Laysan Albatross chick lying on the ground and I am quickly stopped dead in my tracks. I stood there watching this bird struggle in an apparent sense of pain, its eyes glistening with moisture and bill gasping for the last few breaths it could take. Before I knew it, the last ounces of life had passed from its body and in a couple weeks’ time I returned to find a shocking truth within the decaying remains. When I returned to where the chick had died, there clutched within the bones left behind was a handful of plastic fragments similar to the nine bags I have here with me on Green Island. Each bag I’ve collected was picked up from the carcass of a chick who’s likely cause of death was as clear as the vibrantly colored pieces looking up at me. An unfortunate dilemma with being here on Kure or any of these islands is that with all the beauty, there are still a number of harrowing images. Over every acre of the 200 acres that make up Green Island, the reminder of that albatross’s fate is inescapable. Wherever you look, wherever you stand, there are plastics washed ashore and left behind from chicks that either threw up a bolus before fledging or from the ones that died full of it. One estimate from a study conducted from 2007-2013 (http://journals.plos.org/plosone/article?id=10.1371/journal.pone.0111913) reported that there are 5 trillion plastic particles floating in the world’s oceans and a large portion of that total was found in the Pacific Ocean where it concentrates in the North Pacific Gyre, an area north of Kure Atoll. It might sound alarming that from one Laysan albatross chick carcass I collected over 10 bottle caps, a lighter, and many more broken up pieces amounting to what could have been 15% of the chick’s body weight. 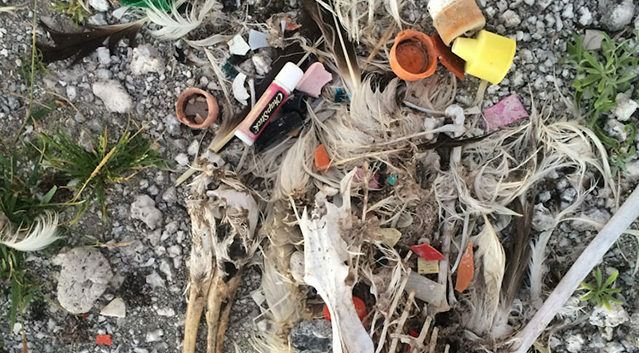 But when you think of the sheer presence of plastics on the ocean surface and that many of these pieces can be picked up along with the prey items adult albatross eat before being regurgitated back to their offspring, it’s doesn’t seem as surprising. I apologize for the images this may present but one could go on for hours on this topic and it’s one that needs mention towards the awareness of these species and efforts to restore their habitat every way we can. For all the hours we spend here restoring the island to its native state, something should be said for trying to restore the ocean and these birds’ foraging grounds to a near native state as well. I don’t know the final solution but in everything I’ve seen brought ashore, it’s clear there are little things each of us can do to have an impact in the long run. Bottle caps stand out as an obvious one. Growing up in a place with access to clean drinking water, it doesn’t make sense to me now why I would drink so often from a single use bottle as a child. Yes, I would try and recycle what I could but what about those lost bottles on the soccer field or beach after surfing? What was stopping them from ending up in the ocean and after a long journey, before my eyes here now? I didn’t know the impact it could have but to see how easy it is to buy a reusable bottle and simply carry it with me and refill it wherever I go, the choice now seems night and day. In today’s world, single-use plastics are an everyday thing and by no means am I proposing one could cut them out entirely. They were created to make our lives easier but what we might not have realized was that in our ease, it may have meant a struggle for another. We can’t change the past but hey, we can still make choices for the future. If it isn’t necessary in the moment, what’s the harm in finding an alternative? Or carrying an alternative? The acts of individual people can all add up. If you could see the things I have seen, the beauty and emotion these birds embody, I feel you, too, wouldn’t want their lives cut short by something like a lighter, bottle cap, or plastic spoon. And, to be honest, I don’t feel it’s just about them either, but that through them we get a sense of our own well-being, our own livelihood, and our own place on this earth.